With the summer approaching, The Belle Isle has been getting busier and busier with people drinking and laughing outside in the sun. Now, with their new menu, it’s even more popular so I thought it was about time I paid them a visit. The Osbourne Road gastropub has been open since 2010 and is a proud partner of Victorious Festival. I used to live on Kent Road, minutes away, but I never visited before. I had peeked in a few times and eyed up the menu however their old one never enticed me the way the new one does. It was a bit pricier with less choice but since the 23rd of May, there has been a lot more delicious dinners to desire. The decor really grasps the true spirit of Portsmouth with wooden tables, colourful wall designs, leather sofas and nautical accessories such as anchors. There is a nice outdoors seating space as, after all, the sun is an essential part of Pompey. When I arrived, the side doors were open and a few individuals read the newspaper and sipped cool cider outside. It’s large and airy inside, with plenty of space for parties to sit down and eat, and friends on a Friday night to sit down and crack open a cold one. I took myself a menu and sat down on the patio chairs, enjoying the sun whilst it lasted and spied all of the new items. Immediately, I noticed that their lunch choice was bigger and there were a few more additions to the main meals. There were plenty of vegetarian and gluten-free options. A few things that grasped my attention were the shipwrecked mussels, lamb and beef meatballs and the brie and mango open sandwich. I say a few because I can’t list the entire menu. There were flavours from all across the globe from Mexican to Southern European, blended together to create a unique menu which adds spice and flavour to our seaside city. It was a bit of a risk but it definitely paid off. I approached the bar. The back was decorated with piled rows of coloured bottles from vodka to boutique gins. Underneath, were lots of fridges holding bottled real ales, ciders and soft drinks. There was enough variety for everyone, no matter who. The drinks were quite pricey. I noticed a sign that listed the beers that were on draught including Stowford Press and Blue Moon but the prices took me aback. £4.20 for a pint of cider and £4.95 for a lager? I didn’t know I was in London. I placed my order which was Mediterranean olives, lamb and beef meatballs, onion rings and the falafel for my friend who had joined me. The bartender turned around and huba huba! A definite plus for The Belle Isle – attractive staff. He was a little shy but in hindsight that may have been my fault, being the female equivalent of a creepy old man. He nervously served me my drinks and olives and then went back to tidying. I sat back down and tucked into my olives. They were placed in a baked bean tin with a handful of toothpicks. “Waste not want not,” I chanted as I ate one, staring at the repurposed bowl. Those were good olives. They were marinated in oil with what I think was garlic, peppers and rosemary. 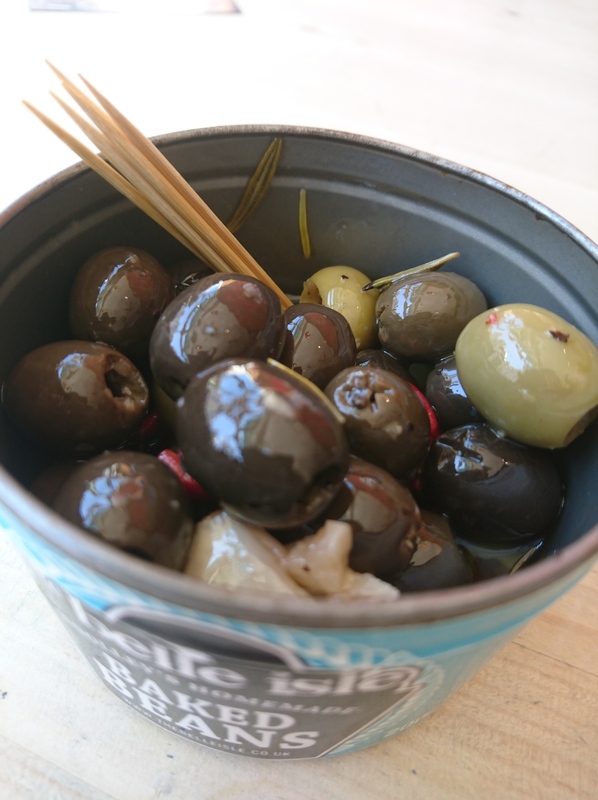 Each olive was soft and sweet. I polished them off pretty quickly. Even the black ones which nobody likes. The food came a while after but I didn’t mind the wait too much. The food is all cooked from scratch and fresh every day which anyone knows is worth it. Although I had started chewing the toothpicks to keep me going. 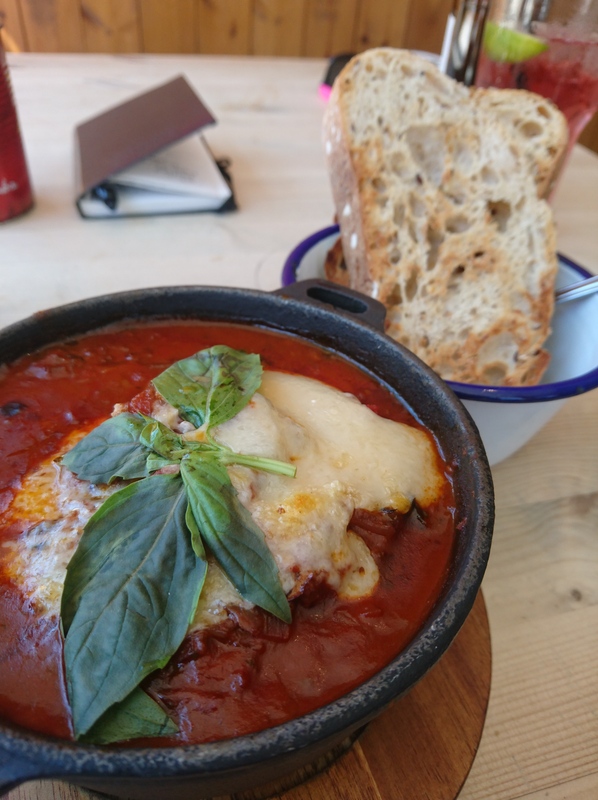 The lamb and beef meatballs came in a metal pot on a board with parmesan and seeded bread on the side. A bit different from the expected pasta. I opened the lid and steam shot out, eventually dissipating to reveal to me a pile of large balls, in thick red sauce, with a dense layer of melted cheese on top. I jabbed my fork in and yes, it did taste as good as it looked. The sauce was made with beans, spinning a Southern twist on the Italian classic. It was full of flavour and complemented the meat brilliantly. Each meatball was just bigger than a golf ball and packed densely and generously. I counted six in total but couldn’t finish them. It filled me right up – good comfort food. 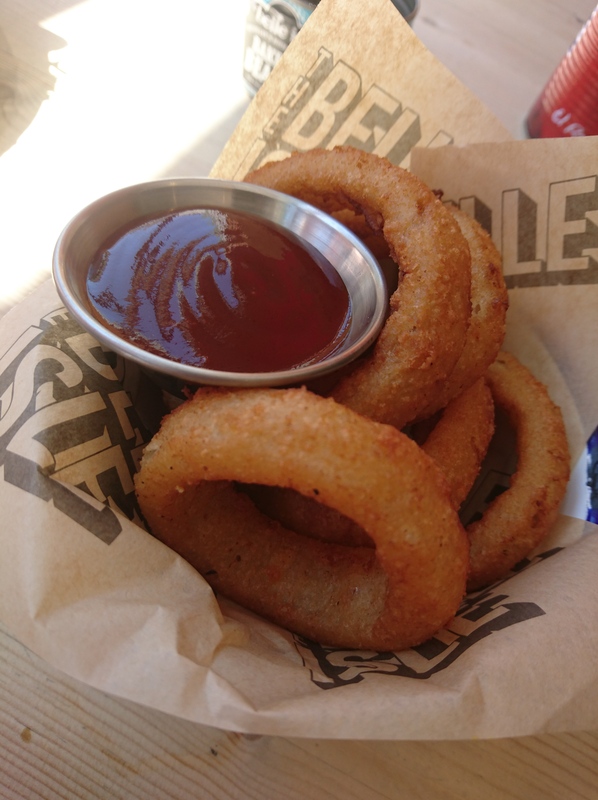 The onion rings were crispy and well cooked and inside were thick, juicy rings of onion. They weren’ t too greasy like most and were perfect dunked into my bean sauce. 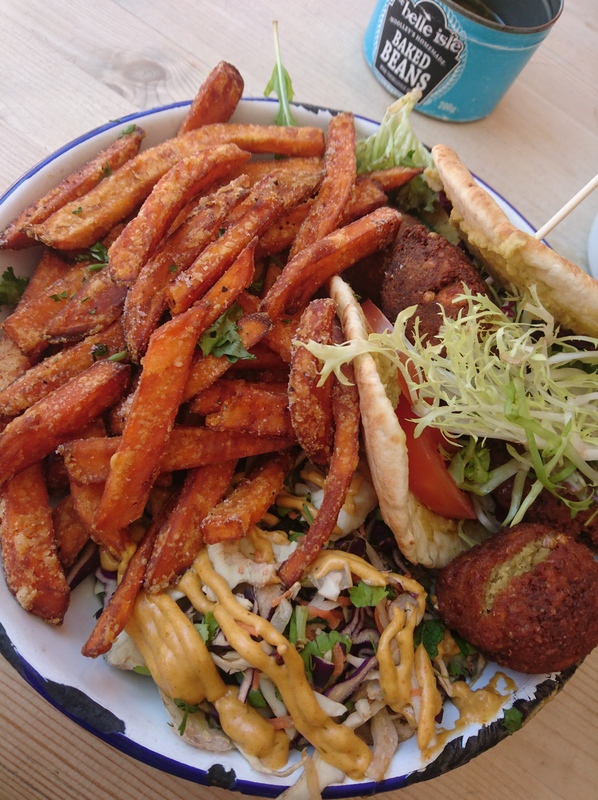 The falafel was also large, covering a huge plate with sweet potato fries and homemade coleslaw. It was also homemade and thick, made with coriander and chickpeas. I managed to steal a morsel. It blossomed with taste and I could smell all the herbs with each bite. The hummus was plentiful and made the falafel anything but dry. As a passionate meat eater, I was surprisingly won over. I did wonder how the other meals tasted. I wanted to try everything but I don’t think I could afford that. I should have gone into the kitchen and flirted with the chef. If the bar staff are so lovely, I bet the kitchen staff are too. The cost for food is a little over average, depending what you buy, and I do find it odd that their online menu doesn’t show you the prices. But their portions are large, tasty and freshly made with local, homemade ingredients. Their meals are different too. It looks like The Belle Isle has certainly improved but I can’t be too sure as I have never eaten there before. The vibes are relaxed and chilled and the food is juicy, flavoursome and unique. The Belle Isle does the seafront proud but I’m not too sure on the drink prices.